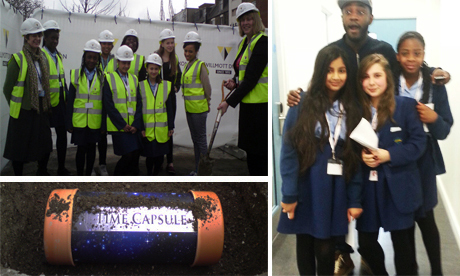 The burying of a time capsule and a visit from a BBC celebrity made for extraordinary scenes at Our Lady’s Convent High School in Stamford Hill yesterday. Year 7 students were spending the day participating in the BBC School Report programme, an annual event which allows students to be journalists for the day. This year’s broadcast saw eleven to 16-year-olds from 1,034 schools up and down the country turn their classrooms into newsrooms. However, there was added excitement in the air at Our Lady’s with the burying of a time capsule underneath the new sports building which is currently being built. Items deemed worthy of burial included a school uniform and a teacher’s planner. Ms Crisp said the time capsule had enabled both teachers and students to become part of the history of the school. “Hopefully we will all be around in 50 years time to hear about its excavation,” she added. Between burying the time capsule and the intrusions of visiting photographers and journalists, students somehow found the time to work on their own stories – one of which was an interview with Radio 1Xtra DJ, Twin B.
Twitter was abuzz with the country’s 33,000 students who had become journalists for the day. Student news reports along with pictures of busy school newsrooms were uploaded to a special BBC webpage throughout the day. “We have written about socialising on Facebook and about music like afrobeats, hip-hop and jazz,” added another student, Daniella Elikma. Working to a deadline, the nation’s students researched, wrote and filmed their own stories, with many being featured on BBC One, CBBC, the News Channel, Radio 4, 5 Live and 52 local radio stations. Daniella Dwebeng-Boadu said that she and her fellow students had been covering topical news-stories at the school, which included reports on the time capsule and on how music affects teenagers. Another year 7 student, Sadia Yilla, said she wanted to be a journalist when she is older.